But Laird Calum MacLeod has a reason for plundering the ship - and it's not a stunning English lass. With no other choice, he takes Anne to his crumbling keep on the isle of Raasay and sends a letter of ransom to her husband. In time, Anne grows to understand MacLeod's plight and finds it increasingly difficult to resist Calum's unsettling charm - until the baron sends a reply agreeing to terms. What made the experience of listening to Captured by the Pirate Laird the most enjoyable? The story flowed thru the book all the way to the end. What was one of the most memorable moments of Captured by the Pirate Laird? When Calum took Anne to catch a fledgling eagle. Have you listened to any of Paul Woodson’s other performances before? How does this one compare? No, This is the first. I enjoyed it very much. I love to listen to audio on my iPhone so I can carry the story around with me when I am working around the house. First audio book b Amy and I gotta say it is pretty good I just wish there was more after they got married.. I'm looking forward to bran story. Very entertaining audiobook to listen to. First audio book by Amy and I gotta say it is pretty good I just wish there was more after they got married.. I'm looking forward to bran story. Very entertaining audiobook to listen to. If you could sum up Captured by the Pirate Laird in three words, what would they be? The characters, they were really rich and well developed and I felt like I could really understand them. Which character – as performed by Paul Woodson – was your favorite? Probably the hero. He make him really enjoyable to listen to. The story itself was an excellent one. This is the first book I’ve read from Amy Jarecki. She engaged me from the first few pages. Her choice of words depicting the scene only engrossed me further. I absolutely KNOW when I’m so drawn in, the author has the right of it. She smoothly moves from scene to scene with plenty of action, suspense and with a swoonable alpha hero, keeping me flipping the pages, however I 'read' it by audiobook. I loved the fact that the Laird Calum MacLeod didn’t want to be a pirate, but to save his clan from starvation he did what he had to do. Wouldn’t we all do that if we were honorable? He was quite an honor-bound man. He would not take a woman not his, even when it was offered him. He was duty-bound to his clan, and would not have them starve the winter. The English had taken MUCH from his Highland neighbors. As far as he was concerned, they needed to stay in England where they belonged. But with his determination to save his clan he found his destiny, the Lady Anne, Baroness to Lord Walton. Having captured and plundered the Flying Swan, he found the lady within the captain’s cabin. Lady Anne, even though married by proxy to a baron almost three times her age, and still a virgin, she found herself face to face with the most amazing masculine specimen she had seen in her life. Yes, my friends, she had encountered our alpha hero Laird Calum MacLeod. She was drawn to the Laird as he was to her. You could say that the Laird was an honorable pirate. He took what he had to and restrained himself when it was only for his own benefit. (What man can do that?) Our fair Lady Anne, saw life a bit differently and here we have the tug of war between what is honorable, what is right, and what is absolutely necessary to keep breathing and living. This was a wonderfully exciting story and made more so by the excellent narrator Paul Woodson. When a male voice reads dialog for a woman, most are able to carry it well. Paul Woodson, in my opinion, takes it further. Women, not only speak differently than men, but think differently. As Paul was narrating what was going through Anne’s head, he kept me within character, using the cadence of speech that depicts a woman’s thoughts. I was quite impressed. And…completely captivated. Paul got inside the heads of the main characters with this thrilling tale. He WAS Anne, he WAS the Laird. His voice only enhanced this exiting story as the emotional tone of the characters flowed exquisitely through the telling. Here is a wonderful partial list of his accomplishments he shares with us. He has narrations of 23 books presently on Amazon. If you are a medieval romance historical romance reader, check out his narrations of books from Ceci Giltenan and Lily Baldwin. If any of my author friends need a narrator who speaks French and German among other talents, seek him out. I'm not a big romance reader because I don't like it when they're very sappy. This one was low on sap and high on adventure and excitement! The female lead is strong and the story is believable enough. I enjoyed this read. The only negative I can say is that the author should have learned a little bit more about nestling eagles to understand their size and what they're like. As a rehabilitator and zookeeper the description was far-fetched, though the eagle storyline was good. Loved the storyline in this love story. Had me worried at a few turns, but great book. Used a few words several times but that's the only thing I noticed. An English earls daughter is married by proxy to a stranger and Baron in a distant land. She is taken hosting aw when her ship is over run by pirates and spirited off to the Pirates home to be ransomed. Will she fall for her handsome captor or save herself for her wedding night to a man old enough to be her grandfather? Would you listen to Captured by the Pirate Laird again? Why? Yes, I would in fact as I type this review I am listening to it right now! This is one of my favorite stories by Ms. Amy Jarecki and since I have the ebook, paperback and now the audio book it brings the story and especially the characters who I love to life! This is the first audio book that I have listened to with Mr. Paul Woodson narrating and I really enjoyed his narration of one of my favorites. In the ebook and the paperback it was Calum MacLeod the hero of the book. 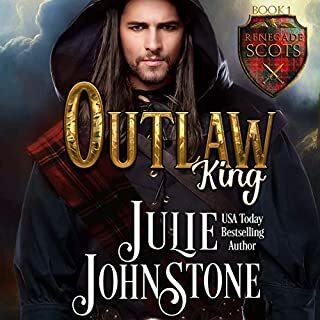 I just loved the fact that he was not only a pirate but a laird chivalrous, bold and handsome but after listening to the audio book it was Lord Wharton and Denton the villains of the book. I liked the almost sing song quality of Wharton’s voice and the deep menacing qualities that Mr. Woodson brought to them. I could just really see them in my mind with no problems! I really like listening to any audio books especially books that I enjoy rereading over and over again. A beauteous highborn cultured English lady and heroine Anne is on her way to marry someone that she have never met to a man old enough to be her grandfather by proxy. Unfortunately while Anne is on the boat is it taken supposedly by Scottish pirates and the red-haired handsome laird pirate and hero Calum. Mr. Woodson has such a wonderful modulated quality to his voice that makes it really a joy to listen to and is able to change the tone of his voice with each character from Calum to Wharton, Denton, and Bran who is a child and lastly Anne the heroine of the book. I really enjoyed Mr. Woodson’s pleasant vibrant voice and would definitely listen to more of his narration of any audio books again! I really enjoyed and loved this audio, it really reflects, Captured by the Pirate Laird, to another level! I loved when Anne is held captive by Calum! Some scenes are filled with seduction and humor! This narrator has a beautiful voice, he was perfect for this audio! Very good choice! I prefer listening to one or two chapters at a time! This story was very well written, some scenes are filled with lots of emotions and the intrigue well developed. So as an audio, it was interesting to listen to! I really enjoyed this Scottish story and looking forward to Ms. Jarecki’s next audio in this series. the narration was painful whilst listening to this audible book., poor accents. would have been better to just read the story and forget the acting efforts. The best part is the narrative. I love the accent. The story may be not very deep but it is a romance after all. Romance not supposed to be deep. It has to be blood boiling. And this one was for me. I wanted to scream with anticipation. 😻😻😻 I live in Scotland and even in contemporary times I’ve seen a men like the Pirate Laird. I love that there is no hours of talk about war and armies and politics. It is about passion and love and simple life. And I could feel every second of it.